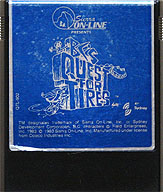 ColecoVision.dk presents: Bc's Quest For Tires © 1983 by: Sydney Development Corporation. 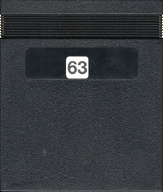 Original SFX Programmer: Sydney Development Corp.
ColecoVision Game Programmed by: Charles Benton, Sydney Development Corp.
ColecoVision GFX Programmed by: Sydney Development Corp.
ColecoVision SFX Programmed by: Sydney Development Corp.
ColecoVision PCB Size, Type and Producent: 32kb., Sierra On-line Inc.™, Sydney Development Corp.
ColecoVision Label Art and Design by: Sydney Development Corp.
ColecoVision Manual Layout and Design by: Sydney Development Corp.
ColecoVision Manual # and Manufacturer: QTD, Sierra On-line Corp. U.S.A.
ColecoVision Box Art and Design by: Unknown, Sydney Development Corp.
ColecoVision Box # and Manufacturer: QTQ 901, Sierra On-line Corp. U.S.A. Pause Feature: Yes, press "0"
It's Cute Chick, and she's in trouble. The Dinosaur is holding her captive. If Thor doesn't get her in time, the dinosaur may even eat her !. Yes, it's your favorite caveman, Thor, straight from the comic strip B.C. Help Thor over the many obstracles, to save Cute Chick from the dinosaur. There's danger everywhere, but it's worth the risk in the cause of true love. High Score For The ColecoVision Version Of: BC's Quest For Tires, Skill level: 1. 1st XName: travis V vu. 1st XName: ed1475. 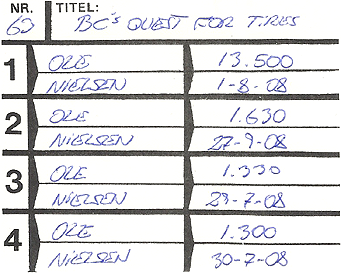 1st XName: Ole Nielsen. XScore: 17.235 - March 29, 2002. XScore: 22.270 - October 12, 2011. XScore: 13.500 - August 01, 2008. 2nd XName: James Carter. 2nd XName: skosh. 2nd Name: Ole Nielsen. XScore: 10.080 - March 29, 2002. XScore: 21.770 - October 21, 2011. XScore: 1.630 - September 27, 2008. 3rd XName: Stephen Knox. 3rd XName: Bmack36. 3rd Name: Ole Nielsen. XScore: 3.240 - April 26, 2001. XScore: 19.480 - July 02, 2018. XScore: 1.330 - July 29, 2008. 4th XName: 4th XName: Bmack36. 4th Name: Ole Nielsen. XScore: XScore: 17.650 - June 28, 2018. XScore: 1.300 - July 30, 2008. High Score For The ColecoVision Version Of: BC's Quest For Tires, Skill Level: 2. High Score For The ColecoVision Version Of: BC's Quest For Tires, Skill Level: 3. High Score For The ColecoVision Version Of: BC's Quest For Tires, Skill Level: 4. 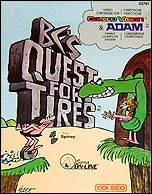 ColecoVision.dk Game # 63, BC's Quest For Tires is last updated: March 24, 2019.